Dean & DeLuca, New York’s legendary gourmet market, where cultural icons from Robert De Niro to Donald Judd discovered a unique selection of food from around the world in the Nineteen Seventies and Eighties, forays once again into the territory of discovery and exploration: with the opening of Dean & DeLuca STAGE in the Meatpacking District, Ole Scheeren has created a new vision for a chef-led eatery design that celebrates food as a profound cultural and social experience. Dean & DeLuca STAGE puts a spotlight on the presentation and preparation of the food created by Dean & DeLuca’s creative culinary team, but equally celebrates the people involved in the process. STAGE is a pristine, magical object which acts as a dramatic backdrop for food, staff, and the choreography of preparing and assembling its delicacies. 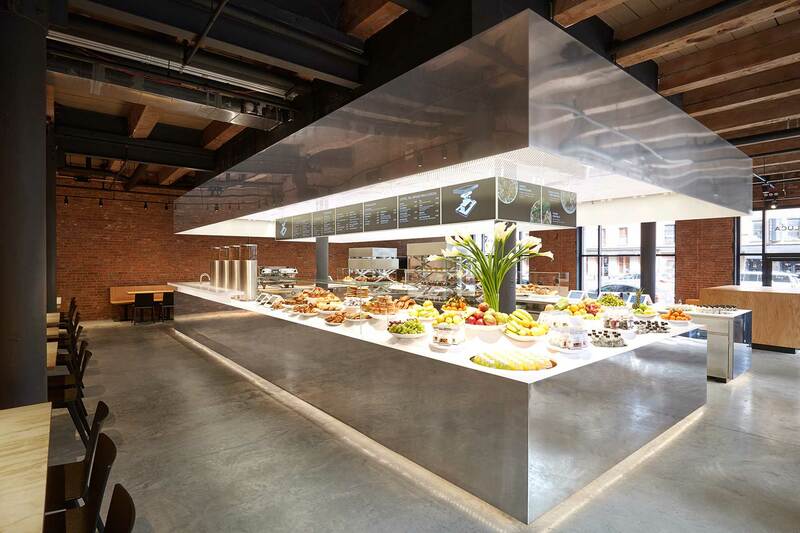 It comprises two horizontal volumes of mirrored stainless steel, one floating above the other and containing an undulating topography of white corian that cradles beautifully crafted dishes and fresh ingredients. STAGE is a freestanding object that allows people to circulate around it as they interact with the staff and watch their food being prepared. The sculpted countertop conceals and integrates the complex, custom-made technology to preserve and prepare the food, in a piece of precision engineering. 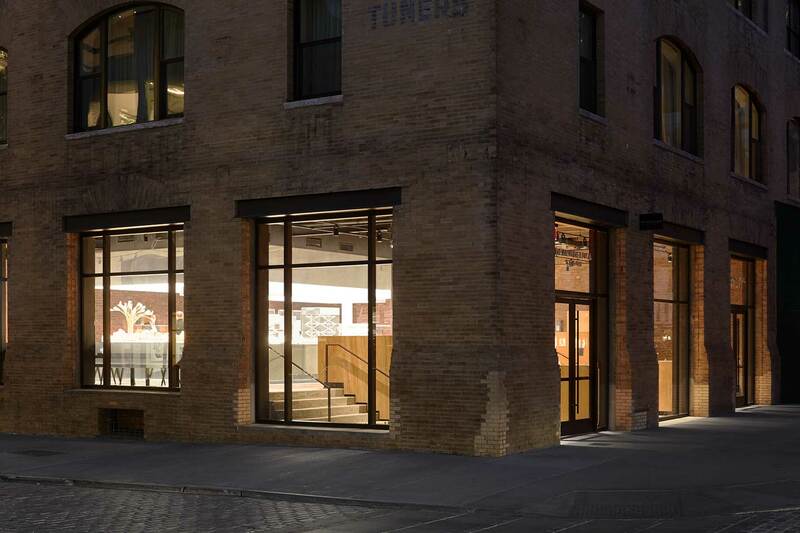 Located in one of New York’s most vibrant and lively neighborhoods, in close proximity to the Whitney Museum of American Art and the city’s High Line, the first location in the Meatpacking District will engage residents and tourists alike in this popular day and evening destination. STAGE was first presented at Design Miami/2016 and represents Büro Ole Scheeren’s interest in shared and communal space, and the ability of architecture to bring people together and explore new possibilities and qualities of social interaction, whether in large-scale developments or more intimate interior projects. The development of STAGE was overseen by OS Development, a New York based project management and design execution firm working with Buro Ole Scheeren.